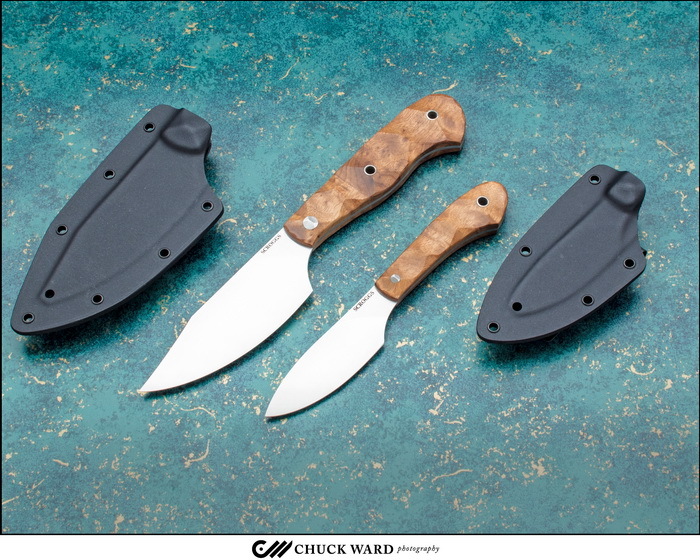 James Scroggs has crafted a pair of ultralightweight full tang fixed blades. A Model 4 Clip Point and a Model 7 Spear Point. They have blades of AEB-L stainless steel, 4.25 and 3.25 inches respectively. The ergonomic Oregon Myrtle Wood handles provides a good grip. This knives appear very simple at first glance, with clean lines and lack of embellishment, but that impression is deceptive. Get these knives in your hands and examine carefully; you will be astonished at the exacting attention to detail, from the flat grind and satin finish on the blade and handle, to the precise fit and alignment of the handle material. A Kydex sheath with spring clip for each is included.